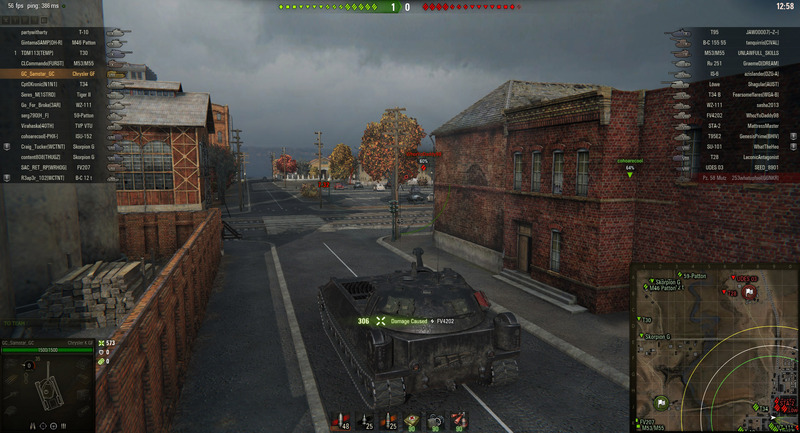 The Chrysler K GF is now available, here’s how to play it in World of Tanks. The Chrysler K GF is the latest Premium tank released for World of Tanks and finds itself amid the most popular tier for Premium vehicles. As a Tier 8 vehicle, the Chrysler K GF has some impressive earning potential, but as a new vehicle, it doesn't get the benefit of preferential matchmaking. So, let’s see how this American Heavy should be played! 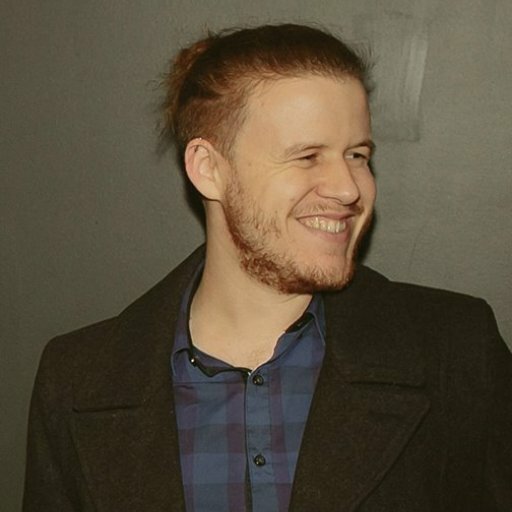 It’s important to remember that the more experienced you become with World of Tanks, the more varied your strategies can be as you’ll know how to perform in different situations. 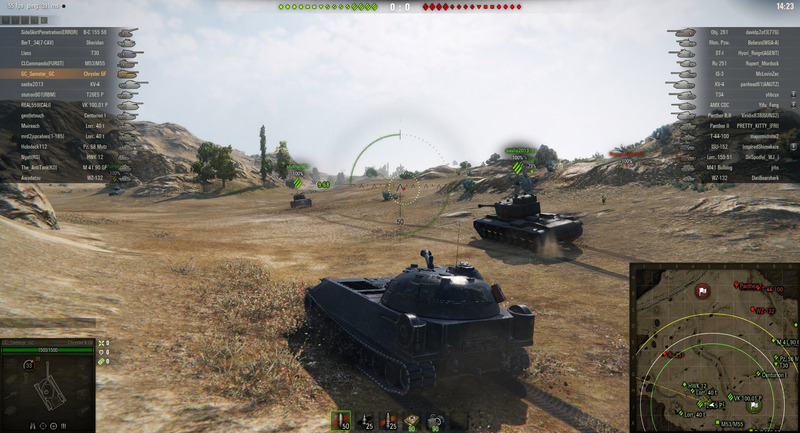 Veteran World of Tanks players, make sure to leave a comment with your own tips for playing the Chrysler K GF. 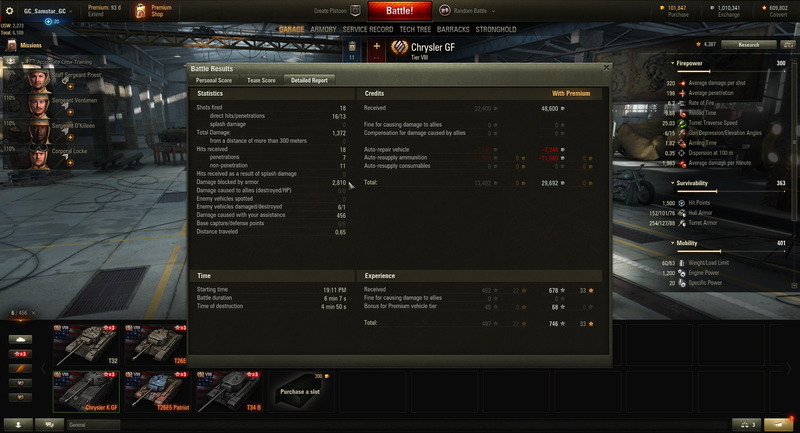 Despite suffering from poor penetration values, the AP rounds on the Chrysler will still be able to damage enemy tanks. One of the first things you’ll note about the Chrysler K GF is its huge ammo capacity, coming in at 100 rounds. This will come in handy as the Chrysler does suffer from poor penetration on its AP rounds, requiring careful aiming at weak points. While it’s not an ideal situation, using APCR can work when facing a tougher enemy, or simply repositioning with the Chrysler’s impressive speeds. Despite the unfavorable penetration values, the Chrysler’s weapon handling is second to none in among similar US tanks. The Chrysler offers great aim times, dispersion values when stationary and when moving, as well as good turret traverse. 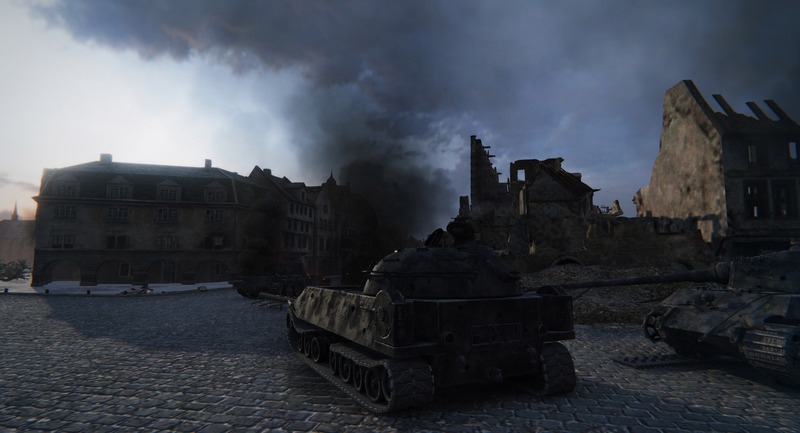 You will be able to accurately hit enemy tanks, but you might not be able to penetrate anything with thick armor or vehicles in higher tiers. Able to block even the mightiest of opponents, the Chrysler's frontal armor is second to none, and will leave your opponents writhing in frustrating and wasting APCR shells. The Chrysler has some absurdly thick frontal hull armor. Coming in at 152mm at the front, 101 and 76mm at the side and rear respectively, the Chrysler has greater defenses than the T26E5 Patriot. When engaging with the enemy, the Chrysler should always have its frontal armor facing the enemy, and to further improve its survivability, pivot the chassis slightly so you’re aiming over the front drive sprockets. 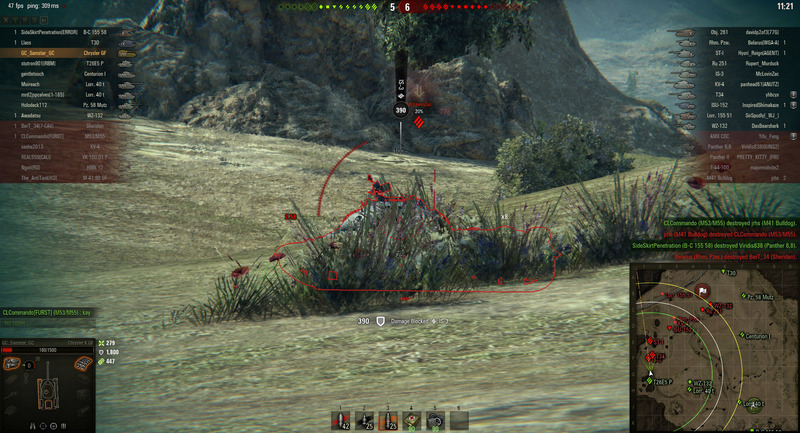 As always, learning how to angle your tank is of utmost importance when learning how to play World of Tanks. Attacks to the Chrysler's rear will swiftly put it down, as will shots to the sides when the angling isn't acute. Though there are no weak points on the front of the Chrysler, you will need to be aware of enemies shooting up at your lower glacis as well as up into your tracks. The armor that faces the tracks is rather thin and prone to penetration. As always, the captain’s cupola is a glaring weak point, so keep moving to make it a difficult target. While the front of the turret is extremely strong (254 mm) the rear of the turret is a mere 88 mm and a prime targets for enemies who want to avoid attacking you front-on. The large profile of the Chrysler also warrants mentioning as you are an easy target to hit, especially for an SPG. Once up to speed, the Chrysler K GF can quickly relocate and get into position. In saying this, thanks to the Chrysler K GF’s good turning speeds and overall movement speed, you will be able to avoid fire or make for a difficult target. It’s still a Heavy tank, so don’t expect blistering speeds. Even an average (or below) player like myself is able to earn a modest amount of credits when using the Chrysler efficiently. Keep in mind that while it’s earning potential is large, it is subject to the vehicle’s poor penetration values. While it isn't considered one of the best Premium tanks to farm credits, it can bounce shots for days and land several dozen hits. While playing a Chrysler, there's also the chance you'll come up against an enemy in the same tank, so it's just as important to know how to destroy a Chrysler as it is knowing how to play one. Overall, the Chrysler K GF is a solid tank with extraordinary armor values, and is best played as a roadblock. However, it can be extremely difficult to push past, especially when angled correctly. When piloting the Chrysler K GF, assist allies who require help, and don’t be afraid to be your own source of protection.